In angiosperms, diverse floral architectures are shaped by pollinators, and different pollinator–plant interactions may lead to variable selection on floral traits in space and time. Heterostyly (a specific floral syndrome where different morphological flower types are found within a single population) has been shown to accelerate floral diversification in Primulaceae, Amaryllidaceae and Rubiaceae. 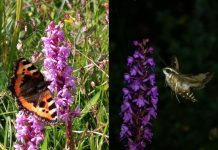 Studies that experimentally quantify the importance of pollinators as selective agents and how this varies spatially and across floral inter-morphs are helpful to fully understand the role of pollinator-mediated selection in the divergence of floral traits in heterostylous taxa. Syrphid fly and bumblebee in Primula secundiflora populations. Image credit: Y. Wu. A recent study by Wu et al. and published in AoBP investigates the influence of spatial and inter-morph variation in pollinator-mediated selection of floral traits in the heterostylous species Primula secundiflora. 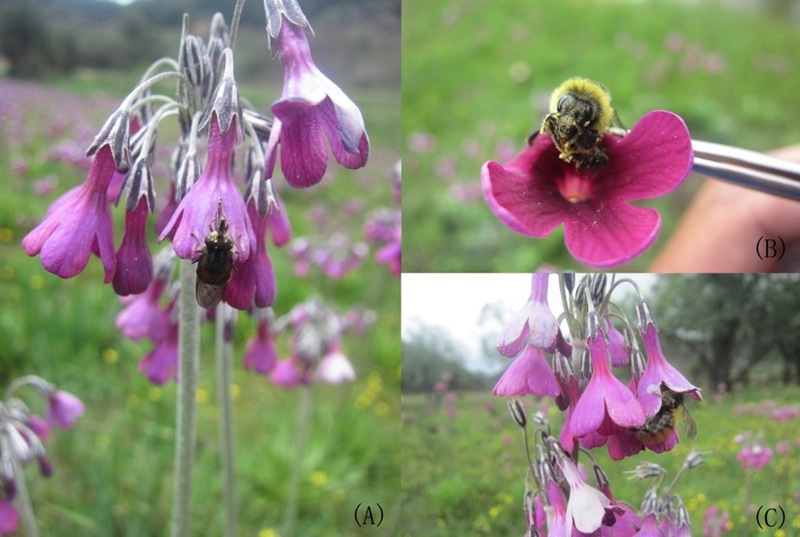 Pollinator-mediated selection was estimated through female function in L-morph (long-style and short-anther phenotype) and S-morph (short-style and long-anther phenotype) flowers among four Primula secundiflora populations with different pollinator assemblages. Results indicated that a wider corolla tube width was selected in bumblebee-dominated populations, whilst shorter corolla tube length and wider corolla tube width were selected in the syrphid fly-dominated populations. Morph-specific variation in pollinator-mediated selection on corolla tube length was also detected in the syrphid fly-dominated populations. 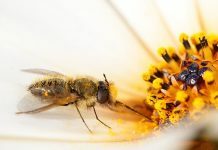 These findings highlight the potential forces of different pollinator agents in driving floral evolution in this primrose species and support previous studies demonstrating pollinator-driven diversification of floral traits. 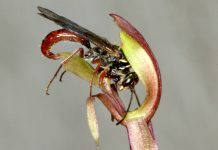 Next articlePlants are weird – and rather wonderful too!